To see for certain, what I thought I knew. But the world was sleeping. Any dream will do." Children are supposed to be safe at school. The shooting in Newtown, Connecticut would be the beginning of the end of the fight against licensing restrictions on firearms. I thought I knew that the solution to poor dating prospects generally does not lie in ramping up one’s antisocial behavior. I thought ‘day of retribution’ referred to a dusty, archaic Biblical prophecy…or maybe a new video game…not a YouTube clip full of threats against women. Speaking of ancient history, I thought I knew that we were done with Wild West showdowns over grazing rights. I thought past due grazing fees in the amount of one million dollars was a pretty good reason for not being able to graze your cattle on federal land. I was pretty sure that it didn’t meet the definition of tyranny to pay a 20-year-past-due tax bill. I thought I knew how to kick my sarcasm problem. Apparently not. I thought I knew that it was a reasonable expectation to go shopping at a Target (no double-entendre intended) or eat at Chili’s without seeing someone carrying long guns. That there was no plausible reason one would need them while buying a grande-nonfat-caramel-ribbon-crunch Frappuccino. I did not think, when I completed seminary, that I would have developed an entire sermon series on violence and terror – most of it gun violence – in less than five years of ministry. I checked. I went back and counted. My ninth sermon to this congregation was on the shooting of Congresswoman Gabrielle Giffords and others in Arizona, January 9, 2011. Then, March 24, 2012, following Trayvon Martin’s killing. I somehow missed the Aurora, Colorado movie theater shooting in July 2012. I think I was away from the congregation that weekend. The same summer, the Sikh temple right here in Wisconsin. I was away for that one, too. No sermon. I did preach on December 16, 2012, following Newtown. April 21, 2013, following the bombings in Boston. July 14, 2013, in the wake of the George Zimmerman verdict. And today. In the wake of the UC-Santa Barbara shooting, in the wake of Tuesday’s shooting in the state of Oregon, a foiled plan for a high school mass shooting in Tennessee and countless others that I didn’t have time to read in my news search. Seventy-two incidents of gun violence in schools since Sandy Hook. 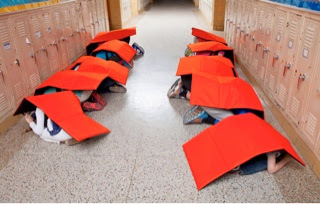 Forty-one deaths in 62 documented incidents in US schools. Eighty-six people die from bullets in the US on an average day. Hear this, O elders, give ear, all inhabitants of the land! What the cutting locust left, the swarming locust has eaten. and what the hopping locust left, the destroying locust has eaten. The shooting in Oregon last Tuesday was the thirty first firearms attack in a US School since the start of the year. Where are we – not even halfway through the year? That’s more than one incident a week. And the solution we get? One-thousand-dollar-a-piece “Bodyguard Blanket” made of bulletproof material five-sixteenths of an inch thick. For our students. That's a thing now; there's a company marketing it. To schools where they can’t afford enough textbooks and paper and teachers. What if we spent that $20,000 plus per classroom to provide the support they desperately need so we don’t have more kids growing up to choose the violent solution? We close our eyes, and we draw the curtain on our national sickness. We treat vulnerable bodies a human shields, arraying them between us and what we do not wish to see, what we do not wish to confront: that our worship of the right to keep and bear arms, the lifting up of the Second Amendment to the US Constitution as a false idol, has led directly to a culture of death. gather the children, even infants at the breast. One mass killing a week. I could be preaching one of these gun violence sermons EVERY WEEK. What if I did? What if all of us did? What if the seventeen percent of the United States that attends to church refused to close its eyes, refused to sleep through this problem? What if we refused to admit defeat? What if we refused to make of our heritage a mockery? What if we stood on the side of the Risen Christ, the visionary Spirit, the Great Creator who is the source of Life and not Death? What if we didn’t just stand, but spoke, and acted, and insisted– held our government accountable for these deaths, for its failure to act? What we have had, to date, is a lack of vision. Remember who we are. We are followers of a visionary who dared to act and speak as if money and military might were not power. We are followers of a visionary – and we walk in footsteps of visionaries – who gave everything for the sake of the work of God. Remember who you are: You are dust and ashes, and you have the breath of God within you! You have seen death and you have risen. You have seen apparent defeat, and yet here you are, walking and talking and singing Alleluia! Community of Christ, how dare we act as if we had no power? your young ones will see visions. Community of Christ, you are those whom God calls. There will be a great rescue. This a great and holy work. The world is waiting. Have you ever had a letter that you read over and over again, so much that it was falling apart? A real letter, on paper, not made up of cascading electrons? Hand-written, probably, although composed on all kinds of paper – lined paper with frilly edges torn out of a notebook; fine stationery; a scratch pad once kept by a telephone. You know the sort of thing I mean? A piece of correspondence that’s a treasure. A letter that is more than mere words on a page, but holds something that was once so true for you that it was worth holding onto. Maybe it’s bittersweet, a note from a lost love; encouraging – words of praise from a teacher or mentor, endearing sentiments from a child or your life partner. Maybe it came in an actual envelope, with a stamp on it and a return address – or perhaps it was tucked into your palm at passing time in the hallways. You might come across one in a family Bible, in an estate-sale book from a secondhand bookstore. Maybe you put yours in a special box, or between the pages of a journal. When I was a teenager, you might tuck a note like that under your mattress. The best ones – the ones really worth saving – don’t stay tucked away for long.